Regardless of whether you’re Golfer 1, 2, or 3 … the key is you know which group you belong to. Because if you want to achieve your goal of enjoying your time on the golf course … you need to understand your motive for playing. The problem arises when Golfer 2 starts to take the personality of Golfer 1 (score!, score!, score!). Because now you’re getting out of your comfort zone as far as how intense you become on the course, as well as how critical you are of yourself each shot. This getting out of your Play (Comfort) Zone also happens when Golfer 2 starts to fall into the traits of Golfer 3. Because in order to find the perfect balance between fun and good scores … you also need to concentrate enough to make a PLAN before each shot. Now, this isn’t limited to Golfer 2 … similar scenarios apply for Golfer 1 and 3 when they move away from their Play Zone. For Golfer 2, a round of golf can be a rollercoaster, with you feeling good playing holes 1, 2 and 3 — before slowly moving into the intense traits of Golfer 1 for holes 4, 5, 6, 7, and 8. So by the time you get to the 9th tee … you’re playing so poorly that you can’t even smile. Which means you’re now morphing into an unmotivated Golfer 3 for holes 9, 10, 11, and 12 — until you make a heroic putt on the 12th green to somehow salvage Par after not smelling a good score since hole #3. While now feeling great on the 13th tee because you somehow regained hope (back to being Golfer 2) – you continue playing well on holes 13, 14, and 15 … until falling back into Golfer 1 for 16 and 17. Which causes you to become too frustrated to care … as you play 18 with the attributes of Golfer 3. Thus, you played a round with 6 good holes and 12 holes divided between mediocre and frustrating results. Whether you’re Golfer 1, 2, or 3 is up to you. But, regardless of what type of Golfer you are … to enjoy yourself … you need to know your Play (Comfort) Zone. Because everything becomes easy when you do! Your swing feels smooth, the golf ball does what you expect it to do … Life Is Good! Though, when you move away from your personality … things start to become more difficult. As your swing doesn’t feel as smooth or as in sync as it was when you were in your Zone. And regardless of how much you breakdown your swing mechanics … you won’t see any improvement that round until you get back into your Play Zone. What happened? Why’d you lose your swing? Yes, good mechanics in your golf swing are necessary. And inconsistent swing habits will cause bad shots. However, those inconsistent habits are more easily controlled and fixed when you stay in your Play Zone. What is consistency in your golf swing? If you hit 7 out of 10 shots well … would that be good enough? Or would you need to hit 10 out of 10 shots in order to call yourself consistent? Though, before you can determine whether your shot was up to your standards … you first need need to decide what you consider to be a good shot. Because a Golfer that scores above 90 can’t hold him/herself to the standards of a low 80’s Golfer. Meaning we see Golfers that score above 90 and 100 hit shots that are similar to the average shot taken by a low 80’s Golfer … tell me the shot wasn’t good enough. So what’s often “acceptable” by the low 80’s Golfer isn’t consistent enough for a 90+ Golfer. The above “not good enough” runs rampant through many Golfers that hold their golf swing with too high a standard. What is considered Consistency for you? Until you can determine what it is … you won’t be able to find it. And although people will always tell us that they know they’ll never be on the PGA Tour … they still use that Player’s skill at hitting great shot after great shot as a measuring stick for their own game. However, this will do you more harm than good. As you’ll be in a consistent state of disappointment because you’ll never be as consistent as these Golfers that spend over 50 hours a week working on their game, strength and flexibility. How consistent is the PGA Tour Player? The average Tour Player hits the fairway using their Driver 60% of the time. That means that they miss the fairway 5 or 6 times each round. Would you consider yourself consistent or inconsistent with your Driver if you hit “only” 8 fairways and missed 6? The vast majority of Golfers we see would proudly declare how inconsistent they were if they only hit 60% of the fairways. Yet everyone of them would take the “inconsistent” swing of some familiar Players that hit less than 6 out of 10 fairways: Bubba Watson, Justin Rose, Dustin Johnson, Adam Scott, Rory McIlroy, Jason Day, Phil Mickelson. All of whom are “inconsistent” with their Driver and hit less than 60% of their fairways. Before you can become consistent … you must determine what’s consistent for your skill level. And what’s consistent for the skill level you hope to achieve. Because you might be the person that will never allow yourself to improve as your expectations of what consistency is … are too high. A 95 Golfer can’t compare themselves to a 6 handicap. The 6 is a 6 most likely because he/she has more time to practice, is more physically gifted, has been playing for a far longer time, and/or has learned from superior Instructors. Thus, a 95 Golfer that doesn’t have the above traits … can’t expect to be as consistent. It’s like going to the gym to lift weights. If you go to workout once a week and another person has gone 5 times a week for 15 years … will you be able to bench press as much as them? If you try to lift the same amount of weight as they are … you’re going to physically hurt yourself. Kind of like how you might be mentally hurting yourself on the golf course expecting to have the consistency of the 6 handicap. As most Golfers make the same swing mistakes over and over – they’re often left wondering why they never improve. We have found that there are a few simple traits that consistent Players possess that all Golfers should be striving to achieve. The primary area that Golfers sabatoge any potential of a good shot is in their backswing. This part of your golf swing sets up the body to allow it to move through the golf ball to produce a good golf shot. However, when your backswing isn’t fundamentally correct … you’ll start making compensations as soon as you start your forward swing – producing inconsistency. There are several actions a struggling Golfer can try in their attempt to find consistency … unfortunately for these Golfers … many of the techniques they try actually prolong the frustration. Consistent On The Range – Inconsistent On The Golf Course? The mystery of why you can’t carry consistency from the range to the course has baffled many Golfers. And as there has been golf psychology books written (and bought by desperate Golfers) about this subject … the issue you’re having has much more to do with how you practice versus the witch doctor teachings of Rotella and others. The common issue many Golfers have is that when they want to hit the golf ball farther … they usually hit a worse than average shot. As the result is often a shot that is short, or flies into the trees, weeds, or water. Why is it that when you try to swing harder … you hit bad golf shots? It has to do with the various parts of your body not working in synchronization. Meaning, when a Golfer tries to swing with more power … the brain doesn’t know how to get you into impact at that faster speed. What is consistency in your golf swing? Is hitting 7 out of 10 shots well – good enough? Or is being able to hit 10 out of 10 the only mark of consistency? We also need to understand what you consider to be a good shot. Because an average shot by a Player that scores in the 70’s could be thought of as fantastic by a Golfer in the 90’s. Many frustrated Golfers have a different golf swing for each of these shots: a chipping swing, a pitching swing, another swing for wedges, a mid iron swing, a long iron swing, a hybrid swing, a fairway wood swing, and of course … a Driver swing. Thus, the frustrated Golfer needs to organize at least eight different golf swings when playing a round of golf. A common statement we hear from many frustrated Golfers is that they have been told they are using too much of their right side in their golf swing. However, working to take your right side out of your golf swing will hamper you efforts of creating more consistency and power. For these Golfers, it isn’t that your right side is doing too much … the problem lies with your left side not doing enough. Or in other words — it may appears as if your right side is doing too much only because your left side isn’t doing enough. Do Your Struggle To Make Your Best Golf Swing Consistently? As many Golfers struggle to play golf to the level they feel they should play – I understand your frustration. 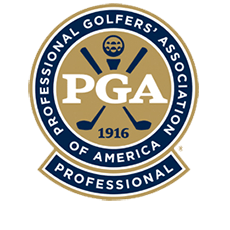 Golf can be frustrating for all levels of Golfers … from the newcomer trying to get the golf ball up in the air to the person qualifying to become a PGA Professional. How can golf look so easy when the PGA Tour Players play … but be so difficult for the regular Golfer? As the Tour Player looks as if he/she is hardly swinging the golf club — the golf ball goes a mile. Yet when regular Golfers go to hit a golf ball, it looks as if you’re either trying to knock the cover off the golf ball or you’re so afraid of swinging too hard … the ball doesn’t go anywhere. How can a good practice session promote a consistent swing? Unfortunately, a vast majority of Golfers rarely experience a successful practice session. As the hitting of golf ball after golf ball is just more time spent stacking new compensations on top of already engrained compensations. Why Not A Consistent Golf Swing On The Course? Have you heard that before? Well … who hasn’t let that pass through their lips after making a big mistake that might leave you with a snowman (an 8) on the scorecard? An Inconsistent Golf Swing Is Like Riding A Roller Coaster! Most Golfers that want to improve their golf swing often go on a roller coaster ride of ups and downs. Once they finally start to get a feeling of hitting the golf ball great … and getting close to the summit of golf swing perfection … out of nowhere, for no apparent reason, their golf swing starts to go downhill. Do You Have The Consistent Habits Of An Inconsistent Golfer? There are certain characteristics that a consistent Player uses that all Golfers should be focused on. As the frustrated Golfer consistently goes out and repeats the same mistakes in their approach to becoming consistent – they’re often left wondering why they are inconsistent. We often find that the frustrated Golfer is constantly implementing new swing tips. And because these Golfers are consistently trying different things in their golf swing – it’s no wonder they are consistently inconsistent. What Causes Inconsistency In Your Golf Swing? The Roller-Coaster Called Your Golf Swing …Are Your Looking For More Consistency? Most Golfers that want to improve their golf swing often go on a rollercoaster ride of ups and downs. Once they finally start to get a feeling of hitting the golf ball great … and getting close to the summit of golf swing perfection … out of nowhere, for no apparent reason, their golf swing starts to go downhill. The frustrated Golfer is constantly trying to incorporate new swing tips into their golf swing. Although trying a new tip into your swing each time you go to the golf course is a consistent habit. Trying to implement the swing tip into your golf swing is not. There are a few characteristics of a consistent Player that all Golfers should be striving to achieve. For if you don’t know what it takes to be consistent … how will you ever make it there? As most Golfers just go out and do the same things over and over again, repeating the same mistakes in their approach to becoming consistent – they’re often left wondering why they never improve. Who is most likely to have a more consistent golf swing … a Golfer with good balance or a Golfer with poor balance? The obvious answer seems to be that the Golfer that has good balance will be more consistent. Now, why will the Golfer with poor balance be more inconsistent? Because the poor balance causes you to have less control of your swing path, swing plane, etc. Are You Really That Inconsistent On The Golf Course? Believe it or not, the expectations of many Golfers of what their range of scores should be is far off. For example: once a Golfer scores a 95 for the first time, they usually expect to score 95 or better in each of their next 10 rounds. And when this doesn’t happen, there’s often a sense of you thinking you’re still inconsistent. The average Golfer uses eight different golf swings when playing a round of golf. Thus causing you to move farther and farther away from consistency because if becoming consistent with just one golf swing is not difficult enough … it’s even tougher to become consistent with eight different golf swings. Why is it that we constantly hear that the key to a consistent golf swing is all about your Swing Plane? It was your swing plane. Why does it seem like some people are “naturally talented” at golf, while others “just can’t get it”? When the talented people first start to play … they soon begin to break 100 before busting through 90 into the 80’s. On the other hand – some people feel as if “I can never get it!” These Golfers started off like most people learning the game, taking baby steps towards improving and then within two years they hit a wall and stay in that same scoring range for the next 5, 10, 20 years. One –stop Fidding by trying to add new things to your swing … you already have enough to think about. Everybody’s going to hit bad shots – hopefully not often, but it’ll happen. This is where a Player has properly prepared by having a “go to drill” they use to regain the feel they have temporarily lost. This drill will help them to find their swing within two or three shots. Does A Smooth Swing Help With Consistency? Are you more focused on making a smooth golf swing or having the proper swing mechanics? There’s a fine line between focusing too much on one or the other. When a Golfer is too focused on his/her mechanics … the smoothness of your swing suffers. When you’re too focused on a smooth golf swing – your swing mechanics suffer.